Somebody call Kermit the Frog and let him know he's en vogue again: Green outfits are trending. Girls on social media are swapping soft pinks and vibrant yellows for shades of pea, jade, sage, lime and lots of green shades in between. The "green aesthetic" (as it has become known on Pinterest) is popping, and there's plenty of recent retail smash-hit evidence to back it up. 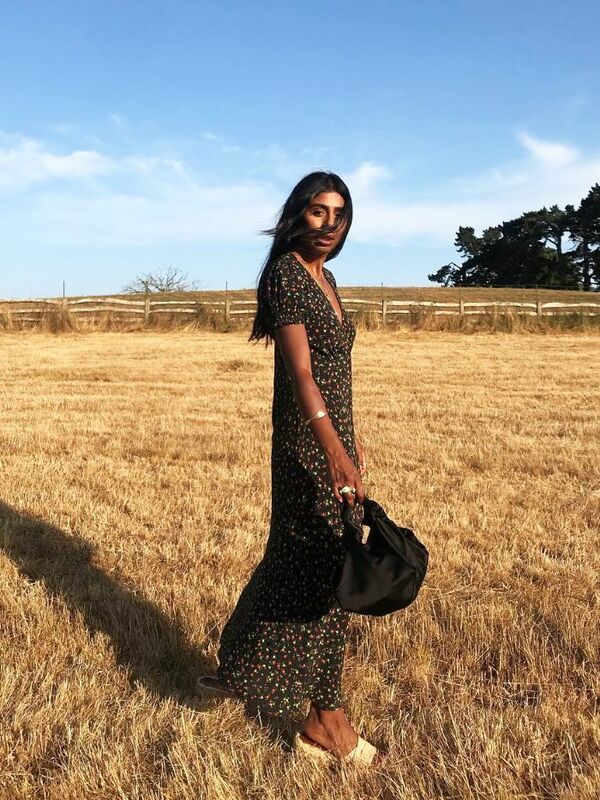 For a few months in a row, we've seen ASOS's restocked green floral dresses selling out before they've barely made it back onto the virtual rails. This is a dress trend we charted all the way back to last summer when Réalisation's wrap dress stole the show. Then there are the Manolo Blahnik emerald satin pumps and Balenciaga Knife slingbacks in a strikingly similar fabric and colourway. Both have been keenly adopted by shoefie-takers the world over, spawning high-street copycats and inspiring women to swap their standard black pumps for green iterations. Of course, never a brand to be left out of a major moment, Ganni's acid-green polka-dot pieces are currently coming to the fore. The fashion world is even going crazy for Nigeria's World Cup 2018 jerseys, and they're instantly recognisable by the bright green zig-zag pattern and matching fluoro socks. We've found plenty of evidence that there's more green action outside of dresses and shoes, too. The 25 looks below show the colour in jackets, matching co-ords, ruffled skirts, trouser suits and much more. So as well as getting some quality green-outfit inspiration to add to your Pinterest boards, there's also plenty of instructions on how to wear green—whether you want to test out the trend or go all-out. Chloe Hill got to it first, but this Ganni Dainty Skirt (£170) is going to fly out of stores. 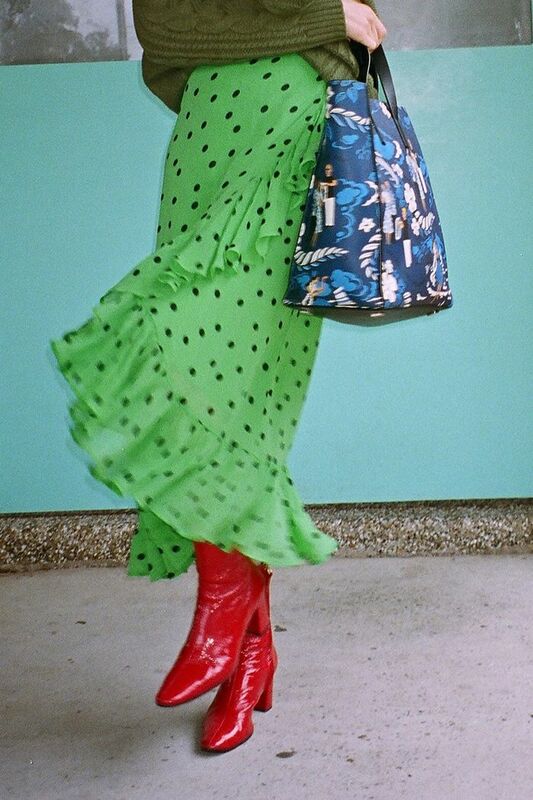 When in doubt this summer, wear a green dress and carry a Cult Gaia bag (just like Babba C Rivera). Donna surprised us all with this fresh formula of mixing a slinky slip skirt with a boxy jacket, sneaks and orange accessories. We'll be snapping up that Joseph jacket now that it's on sale from £515 to £310. French girls, Italian girls (like Eleonora Carisi here) and Brit girls all agree: Green floral dresses are now suddenly essential. Char Ellesse is pulling off this dark-green co-ord and showing that this trend need not be ultra-fussy or twee. Green dresses do look amazing with simple, neutral sandals and a pair of hoop earrings. Ellie is the proof. Emili Sinlev combined multiple green printed pieces with knitwear, lace tights and strappy sandals. She truly proved everyone wrong, as this combination sounds terrifying on paper. We're buying Anne's £110 Ganni bikini as we type this. Erica Davie's beautiful green maxi is from (would you believe it?) Jigsaw. It has now unfortunately sold out, but it's well worth investigating their new-in drops for hidden gems. Here, Freddie Harrel mixed her colourful suit with mustard yellow, and it really worked. Gang of Earlybirds's Insta account is full of new-in pieces that just so happen to be green, including this Mara Hoffman selection. Sisters that dress together have fun together, right? Quite possibly in this case when Hanna (left) and her sibling, Ida (right), both wore shades of green. Jeanette Madsen has been a long-time #GanniGirl and one of the first to showcase this new print. This exact style isn't yet available, but MatchesFashion.com has plenty of other pieces in the same pattern. Jessie Bush's double-green hit includes a Next dress (yes, you heard that right). It's from Mix's collab with Isa Arfen and is a rather tempting buy at £150. We think you're going to want to buy Lucy's Réalisation dress. We've heard that the brand will be shipping to the UK again really soon and launching a pop-up in Selfridges this week. Norwegian influencer Maren Schia combines multiple green pieces and clashing prints to great effect here. Her eclectic jewellery really tops things off. Spanish influencer Maria always inspires us to use vintage clothes for new outfits. Her clothes and bag are vintage, though her retro-look pumps are from By Far. We just had to include a close-up of Marianne Theodorsen's Balenciaga Knife Mules (£545). So perfect with jeans and a white tee. Scandi girl Marie was wearing every kind of green before the rest of the pack. Here she is in a Zara suit and carrying a Chanel bag. Monikh's simple maxi dress is still available. Snap up this Loup Charmont Fortuna Dress (£258) before it disappears. Nnenna Echem's always putting unexpected colour combinations together, and this forest green dress worn with a pink bag is definitely worth copying. Where Pernille goes, many follow, so expect to see this shorts-and-blazer mash-up going viral at fashion week in September. Janka Polliani's Zimmermann dress, Manolo Blahnik heels and Cult Gaia bag are all part of summer 2018's most sought-after lineup. Marta's unexpected jolt of orange set against emerald satin boots and a green checked blazer is truly unique and well worth bookmarking. In case you didn't get the memo yet, satin is back and no more so than in green. Bettina Looney's dress and matchy shoes are enough to persuade us. Okay, now we're really in the mood to shop.